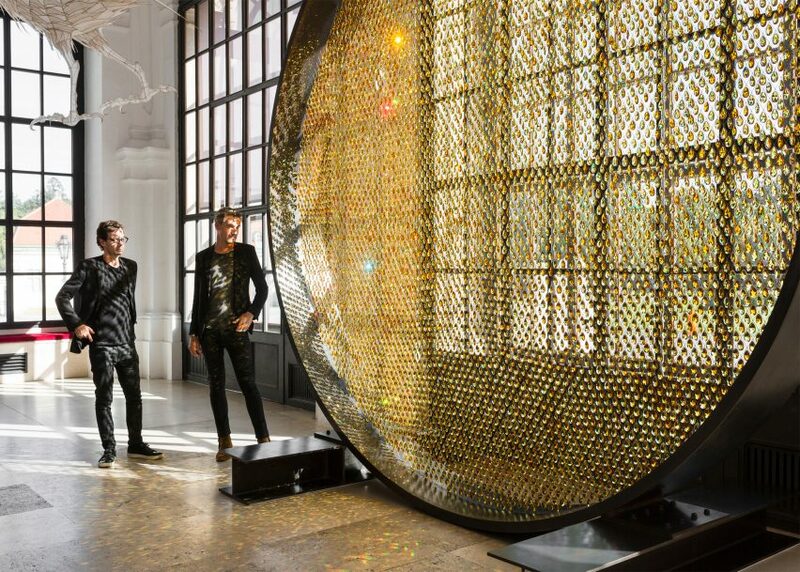 London design studio Fredrikson Stallard has brought its glimmering Prologue installation to Vienna's baroque Belvedere Palace. 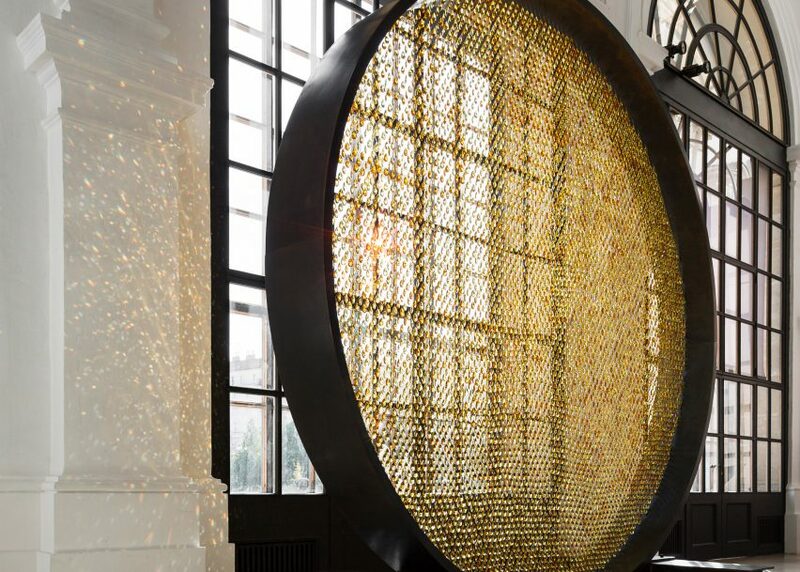 An interpretation of the sun, Prologue contains 8,000 Swarovski crystals held in a round frame. It is four metres high and weighs more than a tonne. 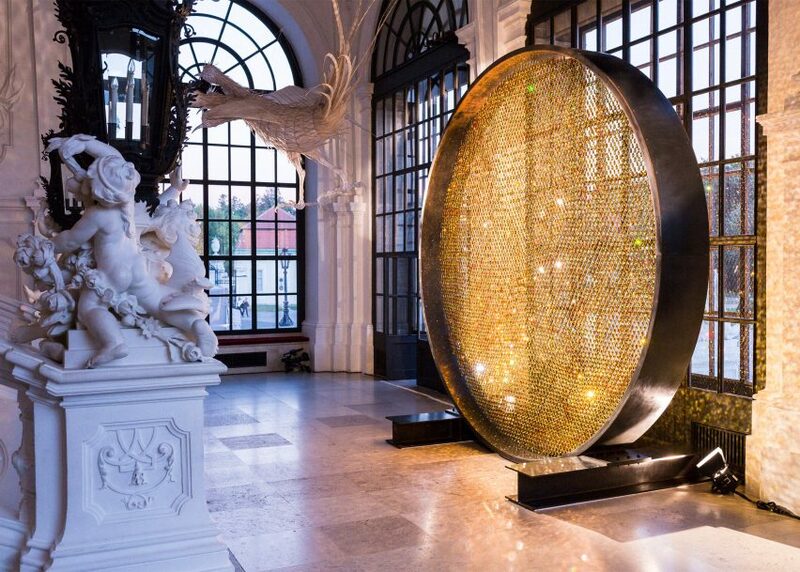 In its temporary home at the Belvedere – which these days houses an art museum – the installation's amber-coloured crystals catch light as it streams into the palace from arched windows. Museum director Agnes Husslein-Arco said this creates a "vivid contrast" with the building's baroque details. "Our idea is to turn the baroque setting of the Upper Belvedere into a place of encounter for baroque and modern art," she said. 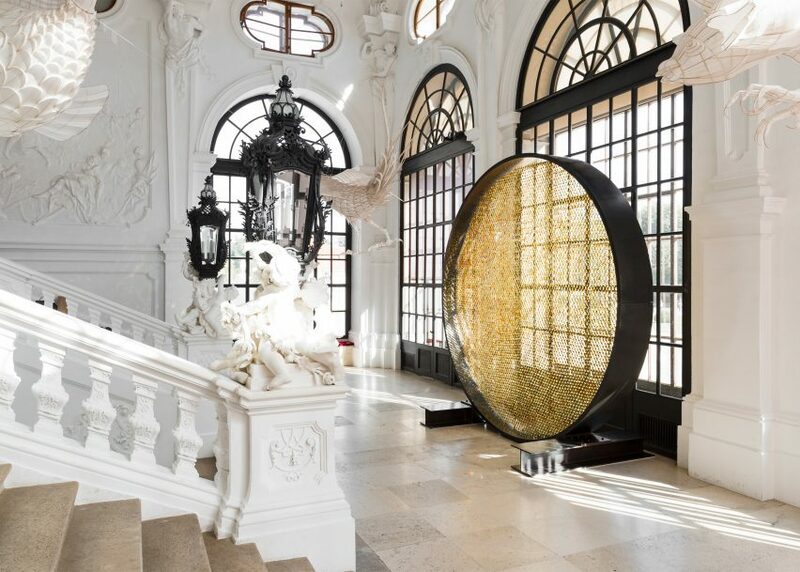 "Following previous exhibitions of works by Ai Weiwei, Olafur Eliasson, Jeff Koons, and Ernesto Neto, Fredrikson Stallard's Prologue stands in vivid contrast to the grand staircase at the Upper Belvedere." Designers Patrik Fredrikson and Ian Stallard first unveiled the installation at 2014's Art Basel Hong Kong, where it was displayed between two buildings. 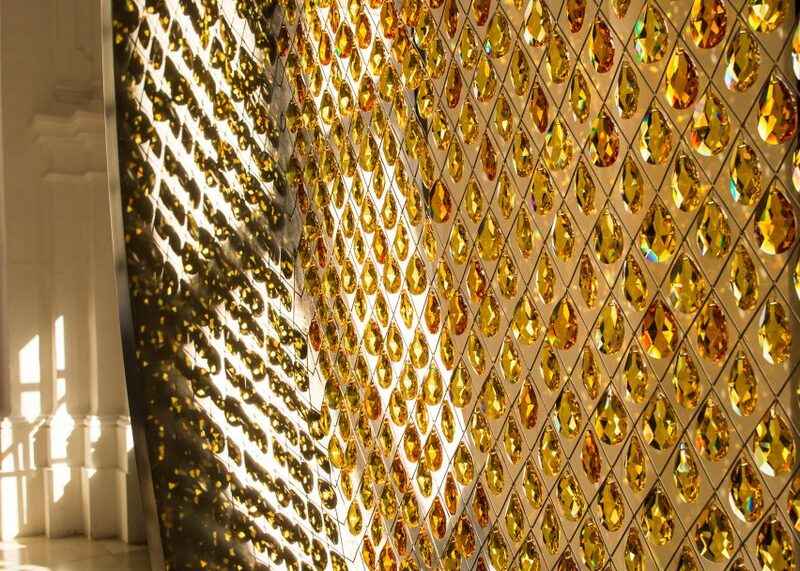 Prologue's crystals are shaped like droplets and arranged on fine wires that criss-cross the patinated steel frame. "In Prologue we are exploring ways of playing with contrasts," said Stallard. "A simple, round shape and the shimmering luminosity of precisely cut crystal creates an oversized lens that reflects the light with incredible intensity." 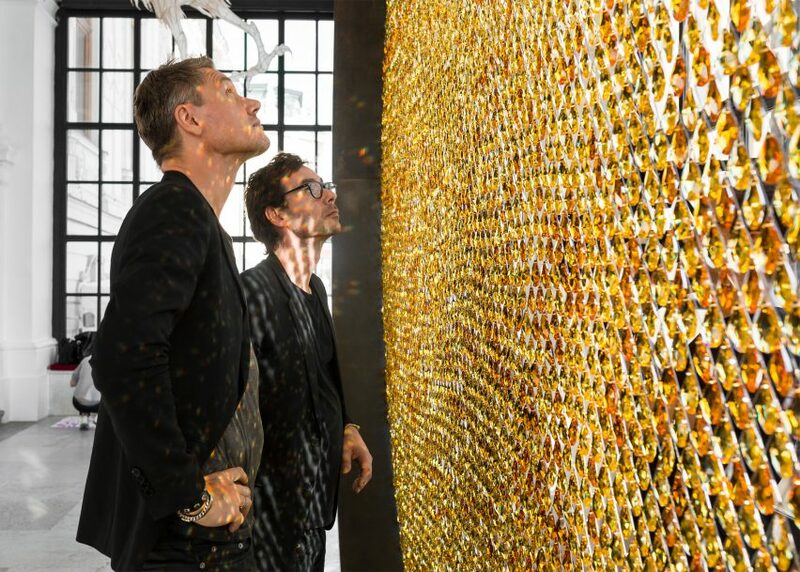 The designers, who began their collaboration in 1995, have previously worked with Swarovski on a number of projects, including the Iris lamps, which were inspired by the human eye. The pair are also involved in the Austrian luxury crystal brand's first homeware range, along with designers Raw Edges and the late Zaha Hadid. Prologue opened as part of Vienna Design Week and will remain on display at the Belvedere until 5 November 2016. Vienna Design Week runs until 9 October 2016. Also at the festival, Mischer'Traxler is displaying a table carved from the swinging of a pendulum, and Thomas Feichtner is presenting gold-washed tableware created with silverware manufacturer Jarosinski & Vaugoin.